Oliver has joined Owen and I on our bicycle ride to school. I asked our nanny to take the photo of us heading out of our apartment yesterday. He was so cute on his first day with us last week! The pride and sense of accomplishment was written all over his face. Ollie still needs a bit more refining, as well does Owen. Most of the ride is through quiet streets or parks, but there are two intersections that are a bit tricky. They are learning how to manage risk, however and develop riding skills that will serve them well throughout their lives. Biking for me is the best form of transport. Belgrade is pretty good for bike riding with many specific biking trails, but they could make more. People drive too fast however, and that is an annoyance and danger for cyclists. 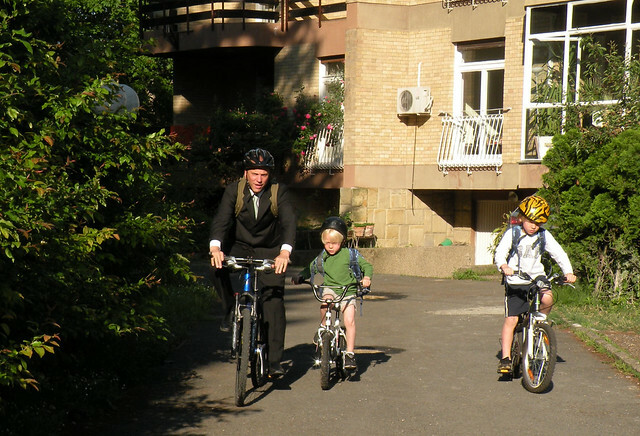 The 1-mile ride to school is one of the best parts of my day. I hope to get Ocean and Nadia also riding to school someday.